The “Banbury” brand name has been synonymous with Quality back to the 1950’s. The original Banbury WIndow was the first window in PVCu to be specifically designed for British homes in 1977 over 41 years ago. The current Management have run the business since 1983 manufacturing only the best quality windows, doors, conservatories and orangeries. Banbury Windows operate from over 40,000 sq. ft. manufacturing facility in Bewdley, Worcestershire and Top Quality Hand Finished products are produced for discerning customers throughout the Midlands. Our products can be viewed at our large showrooms located throughout the Midlands. 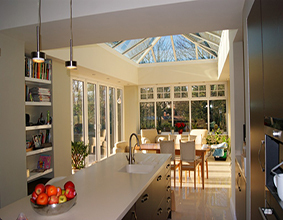 Windows, Doors, Conservatories, Orangeries, and Home Extensions are individually designed to meet customers’ requirements. We do not canvass business, we invite customers to visit our showrooms to discuss their projects and a Full Home Advisory Service is offered Free of Charge from Company Employed Showroom Staff. 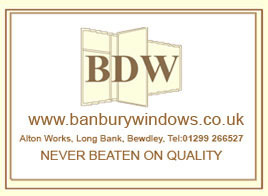 Banbury Windows Limited, a leading Home Improvement Company and Installs its Products and Builds Conservatories and Orangeries throughout the Midlands. Banbury Products and Services: Double Glazing, Replacement Windows, Doors, Conservatories, Roof Trim, Guttering, Clean a Roof, Garage Doors, Building, Electrical Service - Certificated, Turn Key Installation Service. PVCu Windows > Casement Windows > Tilt & Turn Windows > Sash Windows > Doors > Stable Doors > French Doors > Patio Doors > Bi-Fold Doors > Sealed Unit Glass Manufacturer > Pilkington Energy Care Manufacturer > Garage Doors > Roofline Products > PVC Cladding > Conservatories > Tiled Roof Conservatories > Porches > Over Door Canopies > Garden Rooms > Orangeries and Extensions > Now available - Aluminium Windows, Aluminium Bi-Fold Doors, Heritage Flush Sash Conservation Windows.